What are the standard window dimensions? Windows are available in a wide range of sizes and actual dimensions will be defined by particular manufacturer. Typical double hung windows dimensions (width x height) in inches and millimeters. Imperial units are standard measurements in US while most of countries around the world use metric system. The full list will be endless because it is not only many other sizes exist, but also numerous of combinations width x height. 26 1/2" wide window can be 35 1/2", 38 1/2" or 47 1/2" and so on. Also exact measurements will widely vary and many manufacturers offer windows dimensions with 1/8" increment, but there are always will be minimum and maximum acceptable sizes for specific type of a window. Actual width might be 27 1/2", 27 5/8", 27 3/4" or 28” with 47 1/2”, 47 5/8”, 47 3/4” or 48” height, but at the same time width might be limited to 16” min and 54” max. ; the same with height 24” min. and 72” max. Many awning, casement, or picture windows might be combined into one bigger unit. Glass blocks window is a combination of a separate blocks into one piece. Actual measurements of one block might be 5 3/4" x 5 3/4", 5 3/4" x 7 3/4", 7 3/4" x 7 3/4", 11 3/4" x 11 3/4". Glass block window size will depend how many separate blocks will be combined in one window unit plus joints thickness. Similar to the bricks, glass blocks have a nominal dimensions or actual size plus joint. 5 3/4” x 5 3/4” actual dimensions block is 6” x 6” nominal. 30” x 24” window will contain 20 glass blocks: 5 placed horizontally and 4 vertically. What is depth or thickness of a window? Total thickness of a window will typically range from 4 to 6 inches, but some products might be thinner or thicker. 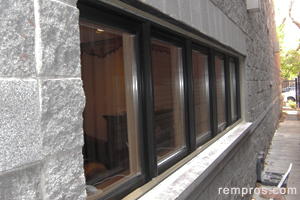 Frameless glass block windows usually are 3” – 4” thick. What is rough opening for windows? Most manufacturers suggest to make a rough opening 1/2 of an inch bigger than actual window dimensions. Usually half inch allowance will be sufficient for proper installation and leveling the window, but in some cases rough opening should be slightly bigger. What is typical glass thickness in the window? Most windows for residential properties made of 1/8” (3 mm) or 3/16” (5 mm) glass. But usually insulated panels of double glass with argon gas or vacuum in between typically used. In many cases the total thickness of such unit with a frame excluded will range from 3/4” (19 mm) to 1 1/8” (mm). If planning to design a house or home addition it is a good idea to check windows dimensions chart offered by a particular manufacturer. But still, windows sizes shouldn’t be an obstacle for any creativity. Most manufacturers will make nearly any size and reasonably shaped window. Local retailers do not have all possible sizes in stock and while replacing windows you might need to order specific size according to existing opening. Getting something cheaper from the store shelf and redoing the opening usually will cost much more comparing to ordering the exact size for replacement the window. How heavy is a window? The weight will directly depend on size, materials and type of a window. 17 1/2” x 21 3/8” vinyl replacement window will weigh less than 10 lb (4.5 kg). But three sections 96” x 54” wood window can easily weigh over 200 lb (91 kg).